Work will start next month at the Moor Lane Roundabout. It's the first action of a major new transport strategy for the city that could see four new park and ride sites built and an Oyster card style ticket system introduced. Highways England have confirmed they will be investing £620,000 into the scheme which will deliver extra lanes on the southern approach to the roundabout and improve local road access from the A30. It comes as the Exeter Transport Strategy 2020-2030 has just been put out for consultation, with the strategy aiming to provide a sustainable transport system which supports continued growth in the city but also enhances the environment for residents, pedestrians and cyclists, and to tackle the challenge that around 50 per cent of people that work in Exeter commute in from outside the city. The strategy outlines that as the city of Exeter is built upon a historic road network, has limited crossings over the River Exe and has limited scope for additional widening / capacity improvements, building extra highway capacity is not possible within the city and so alternative solutions have to be found. The existing transport networks are at capacity in peak times. Some of the actions in the strategy include doubling the number of Park & Ride spaces serving the city with Park & Ride sites on all key routes into the city, improving the quality and frequency of train and bus services into Exeter, as well as improving capacity on the M5 and the A3052/A376 approach around Clyst St Mary. The £2.23 million scheme is being delivered by Devon County Council and is also being supported by the Department for Transport’s National Productivity Investment Fund (NPIF) which is providing £858,000 in funding, with a further £750,000 coming from the private sector. Work is expected to start in February 2019 and continue until August 2019 and will complement the recently delivered Tithe Barn improvement scheme, which included a 60-metre span pedestrian and cycle bridge. Cllr Andrea Davis, Devon County Council Cabinet Member with responsibility for Infrastructure and Development, said: “Increasing the capacity at Moor Lane roundabout is a positive investment in our local infrastructure which supports Devon’s continuing economic growth. It will help city-bound commuters on the A30 in the mornings and will ease congestion problems for people leaving Sowton Industrial Estate in the evenings. It will also help unlock plans to build 1,870 new homes – and enable 370 homes in Cranbrook and Hill Barton to be built earlier than anticipated. HOW DO PEOPLE TRAVEL INTO EXETER? The draft Exeter Transport Strategy says the majority of Exeter residents now travel to work by using sustainable modes of transport with only 40 per cent using their cars. 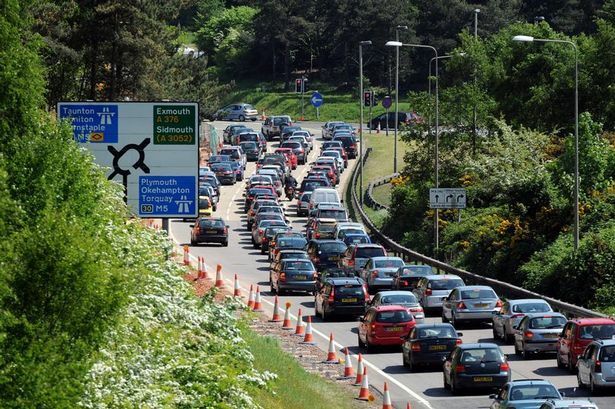 But the strategy has to tackle the challenge that around 50 per cent of people that work in Exeter commute in from outside the city, with 80 per cent of trips made by car, rising to 90 per cent in rural areas. It adds that the number of jobs in the Sowton area of the city equals the number in the city centre – around 20,000 – but twice as many car movements are made around Sowton. The strategy says that as Newton Abbot, Tiverton, Cullompton and Honiton will experience significant growth and the new town of Cranbrook will grow, additional travel demand within these towns and towards Exeter will need to be accommodated, as will travel towards significant new sites in East Devon, including the Skypark and Science Park, and further expansion along the M5 corridor, which are more of a challenge as they lack the amenities of the city centre and lack public transport services. Some additional capacity can be provided on key inter-urban routes with the aim of improving route choice around Exeter. But as Exeter is built upon a historic road network, has limited crossings of the River Exe and has limited scope for additional widening, increasing highway capacity is not possible within the city. Roll out of modern, cleaner vehicles with WiFi to enable productive travel on buses as well as on trains. Comments received during the consultation, which continues until Thursday, February 28, will help inform the Exeter Transport Strategy and action plan which will be taken before Devon County Council’s Cabinet in the Summer. Devon County Council has helped deliver around £80 million of new transport infrastructure in the Exeter and East Devon Growth Point area since 2011. This has included junction upgrades at Junction 29 of the M5 motorway and A379 Sandy Park; new roads such as the Tithebarn Link Road and Clyst Honiton Bypass which have unlocked major housing developments to the east of the city; road widening at Bridge Road; strategic cycling infrastructure such as Redhayes Bridge over the M5, the E4 cycle route and completion of the Exe Estuary Trail. There has also been continued roll-out of Co-Cars car clubs, Co-bikes electric bike hire; new rail stations at Cranbrook and Newcourt in Exeter; and improved bus services East of Exeter. It comes as Exeter College, the University of Exeter and Devon County Council have confirmed membership of Exeter City Future’s Community Interest Company board alongside Exeter City Council and Global City Futures.